Had another great appointment today. Both babies are doing well. 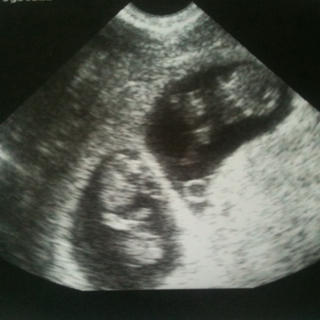 Baby A is measuring 9w3d with a heartrate of 165 and Baby B is measuring 9w5d with a heartrate of 156. They are big enough now to see movement on the u/s so I took a video with my phone. I "graduated" from the fertility clinic today. Of course that's exciting but it was a little bittersweet. You can't help but get to know these people pretty well when you're in there several times a week. I'm still working on getting settled with an OB. It's been somewhat difficult since the hospital on post doesn't want to release me, even though they have no NICU. Hopefully the babies won't need to spend any time there but if they do, I'd rather already be in a hospital that has one than have them flown 30 miles away. So hopefully all of that will get worked out soon. We've been spoiled getting to see the babies so much. Not sure when my next u/s will be. But they're both doing great so far which is wonderful news. This is the best news ever. Good luck on the referral! awwww, april. What a precious video. Thanks for sharing. Love it!! I started following your blog when I saw your news on FB. I just want to say I am SO happy for you and Brandon. Hope you have a happy and healthy pregnancy!